Sol and Rachel do a Blog: Birthday! Are you ready? 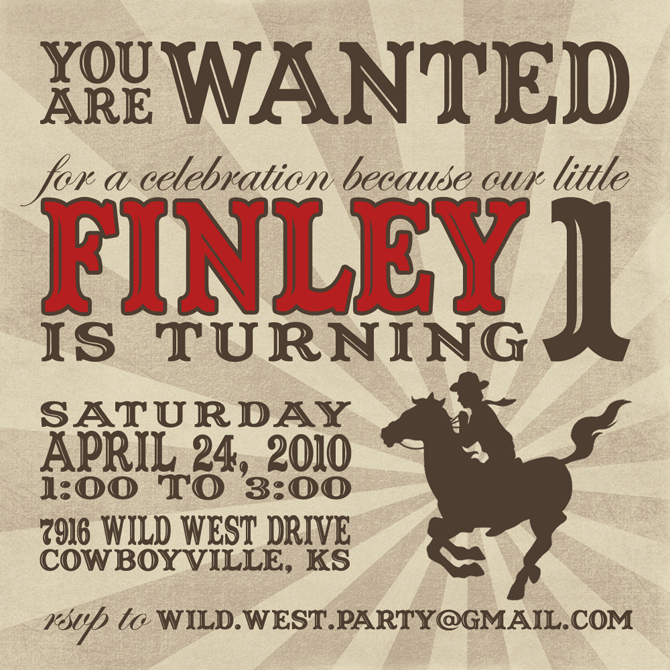 Because you are about to be bombarded with the details of the best first birthday party I ever threw. And because I will never scrapbook this and want to remember what it was like to have time to plan a fun party, more details than you care to know are about to be recorded. 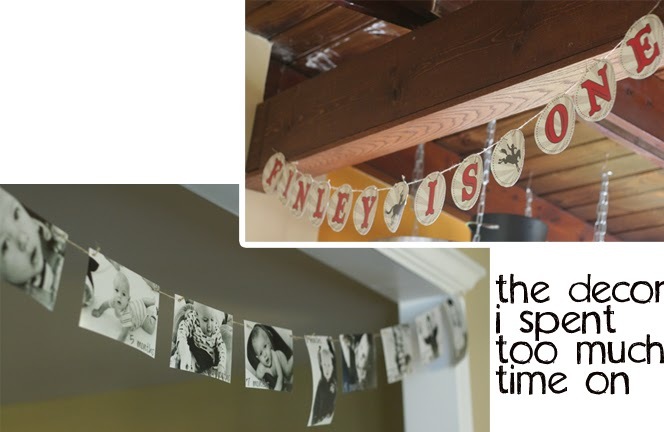 I also worked some Photoshop magic to make a banner of a picture for each month of his little life and a banner that says "FINLEY IS ONE" because "HAPPY BIRTHDAY FINLEY" was waaay too many letters. I punched holes in the corners and tied them together with jute. And then I had to tape the jute because it kept slipping through the holes. I did this about 20 minutes before the party started with wet hair. I was running a little behind. Whoops! Clearly, there were still more things to Photoshop. I made little bags of trail mix that said "Happy Trails Mix" (oh I crack me up) and little cupcake toppers that ended up going in mini-hamburgers because I decided not to make cupcakes at the last minute. 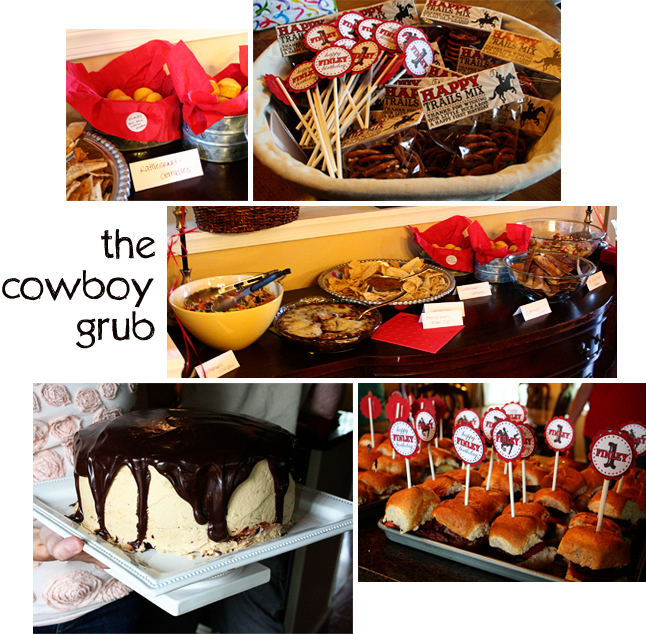 We made lots of food that I thought little cowboys would eat and gave them all silly cowboy names. Cattleman's Coleslaw, Rattlesnake Bites, Bronco Bob's Raspberry Black Bean Dip (courtesy of So Long!) and Lil' Cowboy Sliders. My favorite were the sliders--we made BLTs, cheeseburgers, buffalo chicken and Hawaiian chicken. I've been enjoying the extras for lunch--YUM. Also I made the most delicious and complicated cake I've ever attempted. I promptly froze the leftovers so I can treat myself after the marathon Sunday... and everyday I want to chisel off a little bit. Delish. Because my cake was full of baby poison (chocolate and peanut butter) I made a few cupcakes for the little kids at the party. They were apple and delicious (Vic kept stealing them)... although Finley couldn't tell you that. See that speck of frosting on his finger? 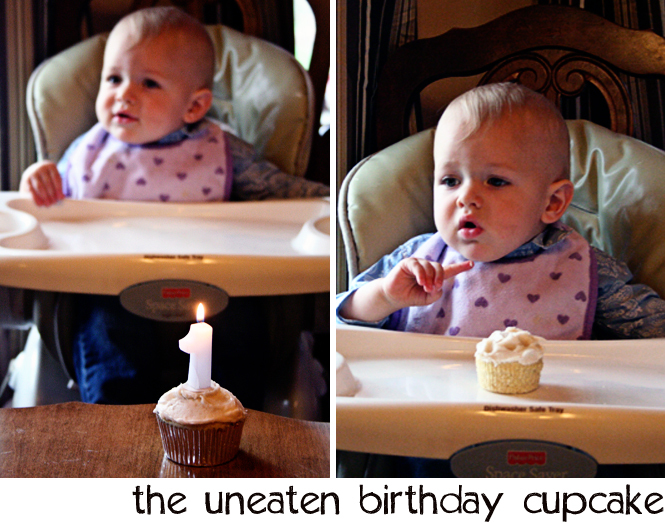 Yep, that was as much cupcake as he had. Not. Interested. Even though he was oblivious to the sugar-y treat I lovingly prepared, he still managed to enjoy himself. He was happy and played the whole time and even shared his toys nicely with the other babies. And at the end of the party when it was time for him to meltdown and have a tantrum, for some reason, he let me hold him and he put his sweet one year old head on my shoulder. It melted my heart. And his outfit? That was the most fun part of the party planning. 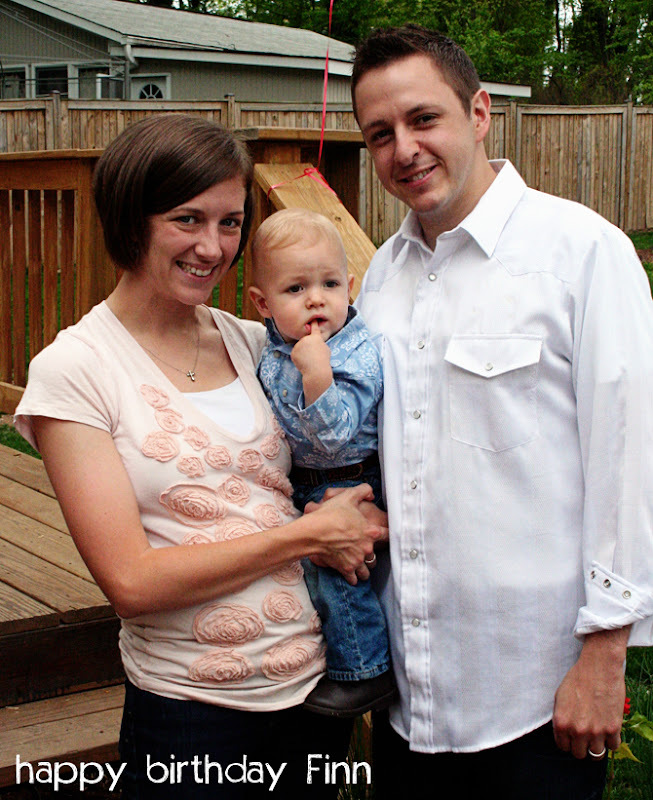 I found darling cowboy boots at Gymboree and then set off on a quest to find him the perfect buckaroo outfit. The Wranglers onesie and belt buckle completed the look. He was adorable. But I guess I'm a little biased. We had SO much fun celebrating with all our friends. We're so blessed to have so many people that love our boy! Thanks to everyone who helped plan/assemble burgers or came to celebrate. That officially concludes all the birthday talk. Moving on. What a super cute idea! I LOVE themes! oh my gosh...those decorations are adorable. i love when people spend time going crazy on birthdays. such great memories you are making! 1. That is the most ridiculously cute bday party I've ever seen. Whoah. Love it. Makes me wish we lived in the area so Kate could attend! 2. You have the recipe for So Long Raspberry Black Bean Dip?! How much do I have to pay to get you to share it with me? You are so incredibly creative... and talented! I'm jealous. Can you become a party planner? I would hire you. ADORABLE!~ I am so so impressed with your party decor - I love it! I am in LOVE with all of the party decor! Very creative and original! Love it! SUCH a fun, adorable, and CREATIVE birthday party. And Finn is pretty darn adorable himself. 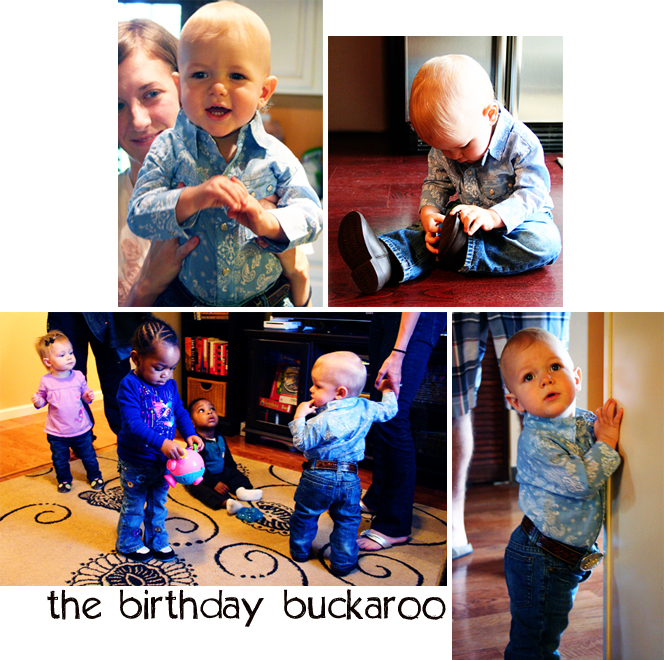 Super cute party, I love his outfit! Very cute party! I just want to know where you found his shirt!! If you care to share, my e-mail is jennynsu354@hotmail.com. Thanks! !